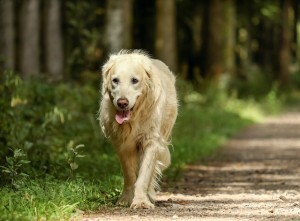 Yes dogs get arthritis too, in fact it is estimated that 4 out of 5 dogs over the age of 6 have some degree of arthritis. Here are 10 ways to make life easier for them. Give your dog a soft bed. Memory foam mats are particularly good for dogs with arthritis as they are warm and very supportive. Beds should also be big enough to allow the dog to lie fully stretched out as curling up becomes more difficult for an arthritic dog. Make sure they are placed away from drafts too. Use ramps and steps to allow your dog to get onto and off furniture or into the car. Having stiff joints and losing the ability to jump shouldn’t mean your dog can no longer be close to you – you just need to make it easier for them. In fact they can feel pushed out by not being able to get close to you and that can lead to behaviour problems or depression. Use non-slip flooring. Laminate floors may be easy to clean but they can make life difficult for dogs with sore joints. They cause them to slide in much the same way you do when just wearing socks and the risk of doing the splits, which is very painful and can be expensive to treat, is quite high. Also dogs who feel they are losing trust in their joints can become fearful of slippery floors which can lead to behavioural issues and possibly toileting problems as dogs become too frightened to move. Ask your vet for medication to ease pain. Arthritis is painful and should be treated as such, just because your dog doesn’t yelp doesn’t mean they are pain free. Dogs have an inbuilt protective sense which means they keep quiet when in pain in order not to draw attention to themselves as being weak and risk being attacked. Use massage to help ease tired muscles, improve blood flow and promote well-being. Arthritis in joints means they are no longer able to move as far or as quickly. This in turn means that muscles don’t get stretched out fully and become shorter. If your dog does then need to ,move quickly to avoid something then they are much more likely to injure themselves. Massage can help maintain the flexibility in the muscles and the range of movement of the joints to avoid injury as well as helping your dog feel more comfortable. Maintain a regular exercise routine. Joints need to be moved to keep them lubricated. The cartilage which protects the joint has no blood supply and relies on the pumping action of movement to coat it with synovial fluid. Make sure your dog has a quiet place to retreat to if things get busy, particularly if young children or other dogs want to play. Dog will often remove themselves from rough play as they get older to avoid the knocks which can be painful but it’s also important to respect their advancing years and monitor their play so as to be able to stop it if you can see it becomes too much. A dog’s teeth are sharp and even the most placid dog can use them when in pain. Make sure your dog is not overweight. Monitor their diet and keep them lean as any excess weight puts more strain on worn out joints. Joint supplements can also be used. Recognise that things will take longer. Walking becomes slower and toileting takes longer. Be patient and allow plenty of time. Help your dog with grooming. Arthritis means some bits get difficult to reach so help your dog by making sure their ears and eyes are clean and their coats are kept clean and in good condition.